We live in a beautiful world where we see wonderful views & special moments almost every second. And you deserve the best possible and most comfortable vision to enjoy even the smallest moments of your life. Whether you have a prescription or not, you may sometimes need the perfect eyeglasses to keep you going from morning to night and get the most of your life in front of the screens in today’s age of digital evolution. Why should I invest in High Quality Lenses for my eyeglasses? Ultra Violet rays are one of the major reasons behind problems associated with vision. Branded lenses usually come along with a superior protection against the UV rays and also offer protection against the Blue Light from the digital devices. Normal to poorer quality lenses, in contrast, only state to have it but in a long run, deteriorates your vision. It can in turn result in increasing your numbers on glasses. Sometimes, low quality lenses don’t offer comfort in vision from all angles. Lenses of superlative quality go through a great impact resistance test. This is because there is a huge risk of crushing and harshly harmful to eyes in case of an unintentional influence or accidents. This could be a serious note to consider as children wear glasses too. Investing in higher quality eye glasses is one of the most important & key factors of eye care. With COCO LENI, this investment doesn’t have to be that huge. Which material of eyeglass lenses should I go for? Here’s are the various materials that lens manufacturers use to produce lenses for eyeglasses listed below along with their pros & cons. Standard plastic is a thick material made of a plastic polymer called CR-39, that is not shatterproof or impact resistant. Standard plastic is an older technology and is usually the cheapest material available for eyeglass lenses. Because of its good optical qualities and economic pricing, CR-39 plastic still remains as one of the popular materials for eyeglass lenses. Originally developed for helmet visors for the Air Force, for “bulletproof glass” for banks and other safety applications, Polycarbonate lenses are lighter and sturdier than plastic ones. These impact-resistant lenses are a great choice if you have a very active work life where your eyeglasses could easily get damaged, play sports or have kids who are tough on their specs. They also come with a built-in UV protection. Enough to say that it’s the preferred material for children’s eyewear, safety glasses and sports eyewear. This lightweight eyeglass lens material with similar properties like the polycarbonate is called Trivex which was introduced for eyewear in 2001. They’re lighter, thin, and very much impact-resistant. They also correct vision better for some people. In response to the demand for thinner, lighter eyeglasses, high-index plastic lenses were introduced. These lenses are better than CR-39 plastic lenses as they have a higher index of refraction and are of superior quality. 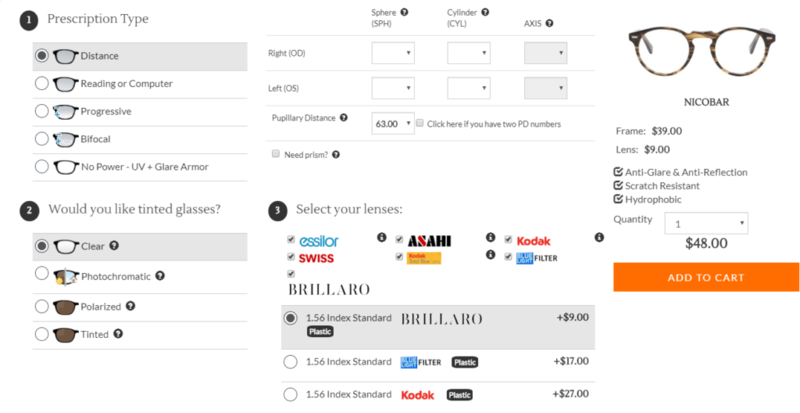 What options do I get while choosing Eyeglass lenses? Here are some of the other factors to consider before going for a lens (Refer to the screenshot below). While the prescription type is typically as per your vision test, other things like tint & brands can be chosen as per your personal choice. Kodak lenses can provide you with the richest, most vibrant colors imaginable. Kodak Precise is a premium enhanced progressive lens that has a wide near zone for natural eye movement, a smooth transitional zone & a clear distance zone. Kodak Precise Lenses offer clear vision at all distances. These are scientifically developed using a revolutionary new mathematical process called Vision First Design. KODAK Single Vision and Bifocal Lenses provide better peripheral vision as they are flatter with very less bulge. These lenses are thinner than standard lenses and up to 30% lighter in weight thus giving a clear & comfortable vision. From KODAK Single Vision & Bifocal Lenses to KODAK Concise™, Unique and Precise™ Progressives, COCO LENI offer solutions for even the most difficult to fill prescriptions. Improve on-road vision with DRIVEWEAR Transitions Lenses which uses polarization in their lenses to improve vision while driving. The NuPolar® polarization removes glare off the road and car hood that’s often one of the greatest problems for spectacle-wearing drivers. Transitions® photochromic technology adjusts the color and tint of the lenses as light conditions change, providing ideal color and clarity for driving. Drivewear lenses are capable of sensing and reacting to varying light conditions both outside and behind the windshield of the car. From bright sunlight and, blinding glare, to overcast dull weather conditions, Drivewear lenses provide you with the appropriate visual solution for your life on-the-go. Discover more about Drivewear here. Varilux lenses make your transition from near to far and every other distance in between very smooth and effortless. The Varilux® Physio® lenses features all the benefits of Varilux Comfort®, and uses the prescriptions from both your eyes so your lenses are calculated as a pair, thus letting your eyes work better together. Know more about Varilux’s range of lenses here. Between computers, tablets, and smartphones, we’re looking at screens more than ever before. All that screen time can be hard on your eyes and cause eye strain. CRIZAL Prevencia® lenses are enhanced single vision lenses that provide sharper vision than ordinary single vision lenses. Most of their lenses come with the Smart Blue Filter™ feature, which reduces exposure to Harmful Blue Light. See more lenses by CRIZAL here. ASAHI-LITE claims to manufacture the world’s thinnest lenses, using DAS (Double Sided Aspheric) technology and FreeForm lenses that take visual clarity to new levels, thus greatly minimizing the strain on eyes. Their eye lens don’t just help you see better, they help you feel comfortable and focus on what matters to you. It’s this combination of groundbreaking vision solutions that keep your eyes relaxed and protected. Find out more about Asahi lenses here. Everyone deserves the most comfortable vision possible. That’s why COCO LENI offers you a wide range of branded and high quality lenses for your eyeglasses to promote better eye care and health. Get Top brand prescription lenses now at COCO LENI at 50-70% less. Bonus? All lenses come with best Anti-Glare Coating.